No folks, not a single aspect of what’s to be said here contains reference to E.L. James’ book series or its accompanying films. So let’s just get that out of the way from the start. That said, the title’s presumed play on words wasn’t chosen for its click-baiting potential either. Last week, I had the pleasure of sitting as part of a jazz critics roundtable, “The Year in Jazz,” which is going on eight years of well-loved and successful execution, thanks to the enthusiasm and straight up hustle of one, Nate Chinen. (You may have heard of him; critic for WBGO and the author of new, NPR-saluted book, Playing Changes: Jazz for the New Century. )The evening was one of enthusiastic discussion, gripping jazz tunes, and enough food for thought to fill a multi-course meal. After the night was over and I had a chance to process everything that had not only been said but that had transpired overall, some reactionary thoughts on the topic of jazz criticism at large started to sneak through and it seemed a large disservice to the experience I had, not to (of course!) write them down. Firstly, as someone who did not first launch her collegiate pursuits or writing endeavors from the canon of jazz but rather is growing into it more with every passing day and every passing song played and heard, one of the biggest topics I was left musing on was the expectation of implicit knowledge that appears to accompany jazz criticism. There’s this kind of prerequisite that heavily suggests you simply have to know things and if you don’t, that makes it quite difficult to feel stable and on equal footing with one’s peers. To an extent, you literally have to study. Now, as a scholastically-enthused person, this wasn’t as daunting as it may well be for others who find anything fit for the inside of a textbook to be akin to corporal punishment but, even someone who likes having their nose in a book or ears fixed to a record can see that the barrel of jazz’s canon is ridiculously long and hard to crack. In this way, jazz has to contend with difficulties surrounding its accessibility and the cumulative contextualization of its history, as far as new fans are concerned. Postulating an intimate, easily flowing familiarity with the length, depth, and complexity of jazz’s history – its artists, iconic performances, super-group collaborations and more – is kind of akin to expecting someone who has never seen Grey’s Anatomy before, to know and understand everything that is currently going on within its 14 completed seasons. (And this is coming from someone who is acutely aware of just how much time multiple seasons of drama can take to cover. Hint: it’s a marathon, not a sprint.) Jokes aside, there’s a notable parallel here. A character and arc driven show like Grey’s Anatomy is flooded with characters who each have their own long and detail heavy histories, which intertwine with every other character’s own complicated narrative. The point is, there is no short cutting of the process. You have to hear the whole record (in an undivided attention kind of way), you have to stay for the whole concert, hear the whole lecture.You can’t get a Cliff-Notes version of anything. Well, okay, that last one isn’t entirely true. (Vox actually just finished up a great trio of videos – starting with an analysis of John Coltraine’s “Giant Steps”– looking at cultural phenomenons connected to jazz, in brief but engaging segments.) However, even well assembled summaries like these only serve as introductory engagements and what lies beyond them, if someone then gets inspired to venture forward, can still feel overwhelming and like an instant recipe for getting lost. How do critics of the present, those with the most active and widely heard or read voices, want to deal with this quandary? 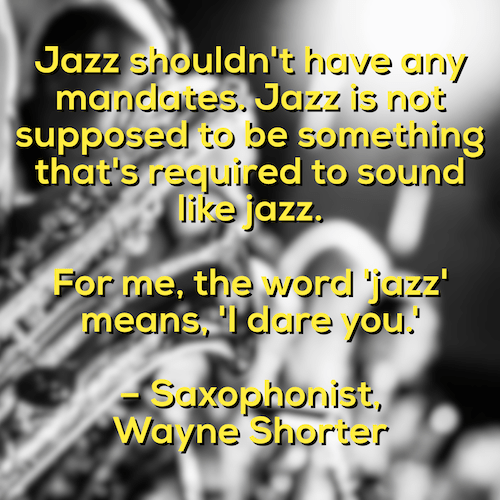 It stands to reason that a large part of why jazz as a topic comes with such a long but un-detachable chain, is because the undying question of how to interact with established song forms and that which is aiming to be new or less historically formal, has yet to be answered. And so, with no universally accepted ratio for negotiating the past and the present, jazz – along with its extremely dense appendix of techniques, people, and giant web of interconnected relationships – has to bring everything along, in full, everywhere it goes. Much like extreme packing for a vacation, you never know if you might need it and better to be safe than sorry, right? This is the main sticking point of difficulty I think always comes back to haunt the genre and its critics even though, really, it’s not the critics’ faults they come to know so much. They have to, as its a staple of the style’s expectations. What needs a solid reevaluation is the cultural group think about why this staple hasn’t been adjusted to be slightly less affixed to the learning curve. Looking at things another, less intimidating way, what I gleaned from my fellow panelists last week was that a significant portion of their collective understandings, anecdotes, and subsequent opinions on jazz events of the present, seemed drawn from an origin point of relating to someone they know/knew or a show/event they had seen. In no way do I begrudge my peers for the lives they’ve lived, the choices they’ve made, or the things they’ve professionally been through – that’s the nature of a well-lived, people-textured life. At the same time, realizing that a lesser amount, or sheer absence, of jazz-oriented experiences can leave a person feeling disadvantaged or detached, there’s a reminder that all music criticism – not just jazz – comes with this additional need for built-in experiential leg work. While a person can say they are a heavy concert-goer, when choosing to focus on a specific genre, it’s almost like nerfing your show-goer stats back to zero and needing to fill up that well from scratch. It’s not all that different from every to-do list prepping new 20-somethings to the world of large music festivals like OutLands, Bonnaroo, Firefly, Glastonbury, and such.